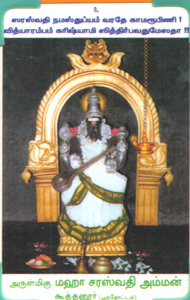 Koothanur is the only temple in Tamil Nadu for the goddess Saraswathi (Goddess for education). The town is located at a distance of 25 kilometres from Tiruvarur.Lord Saraswathi is considered as the goddess of knowledge so people believes that if they worship this deity they will become good in knowledge. Koothanur is the birthplace of the Tamil poet Ottakoothar. Rajaraja Chola II presented this place as a gift to the poet Ottakoothar, that is why it is named as Koothanoor. It is also called as Ambalpuri. The One and Only Temple which is famous for Sri Maha Saraswathi in Tamil Nadu.Vijayadhasami festival is celebrated in Koothanur which is one of the most important festivals in this temple. Devotees throng the place praying for their children’s education.On full moon nights, children are brought here in droves and the word “Om” is written on their tongues, with a stick dipped in honey. It is believed that such children blossom into fine orators, poets and musicians.She has the swan as her vehicle. Just as the swan separates milk from water, She sees only the good part of Her devotees and blesses them.